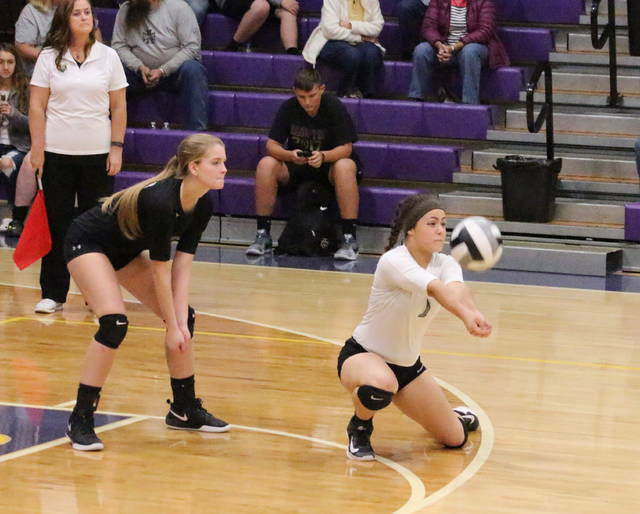 River Valley senior Jordan Garrison, right, receives a serve during Wednesday night’s Division II sectional semifinal volleyball match against Unioto in Chillicothe, Ohio. CHILLICOTHE, Ohio — The Lady Shermans are the top seed for a reason. 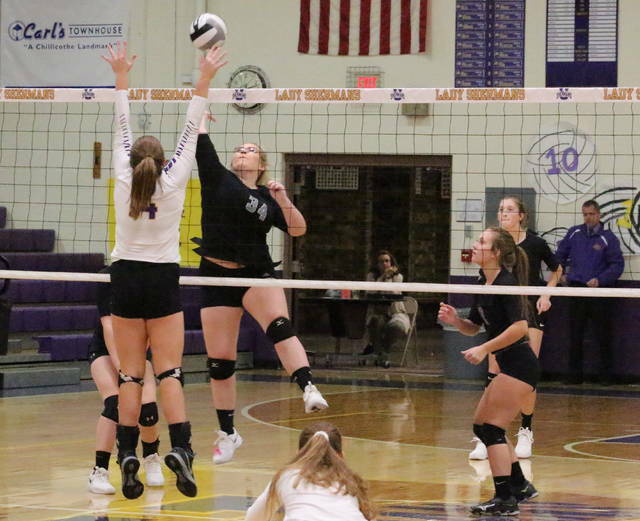 The River Valley volleyball team mustered only four service points, five kills and 18 points total on Wednesday night during a 25-9, 25-4, 25-5 setback to host Unioto in a Division II sectional semifinal contest in Ohio’s First Capital. The eighth seeded Lady Raiders (10-13) never led throughout the match, although the guests did manage to force a single tie at one-all in Game 3. UHS (23-2) built leads of 10-2, 16-0 and 19-4 in each of the three sets before rolling to an emphatic straight-game triumph. The Purple and Gold — who won a share of the Scioto Valley Conference championship this fall — will host Vinton County on Saturday in the sectional final at 4 p.m. 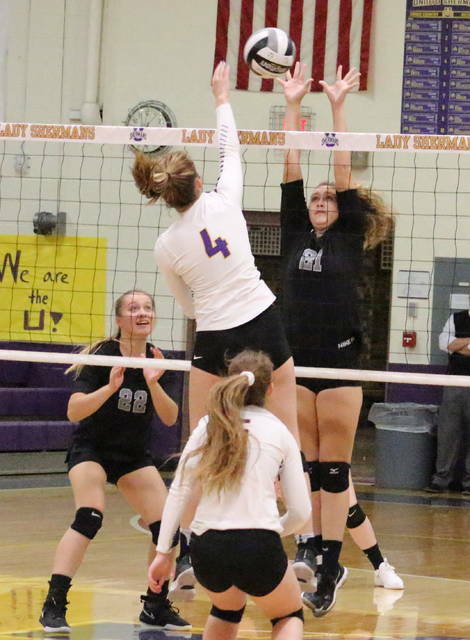 The fifth seeded Lady Vikings knocked off fourth seeded Warren by a 22-25, 25-14, 30-28, 15-25, 15-9 margin on Wednesday evening in Vincent. The Silver and Black, on the other hand, complete a season in which they produced more wins this year than the program had churned it over the previous two. It was also the second straight postseason in which the Lady Raiders ran into UHS in the sectional tournament. Afterwards, RVHS coach Brent Smith acknowledged that there wasn’t much his troops could do against the Lady Shermans. The second-year mentor, however, was proud of what these girls managed to accomplish over the course of 23 matches — especially in knowing that his first season led to a two-win campaign. “I don’t believe that this senior class won more than six games in any of their previous three seasons with the program, so being able to reach double digits this fall was a huge step in the right direction for us,” Smith said. “We’ll lose four seniors from a somewhat young squad, plus we have some younger kids coming that should help us over the next few years. I think our future is looking better than it did a year ago. River Valley kept things close in the early stages of Game 1, but Unioto broke away from a 4-2 lead by reeling off 10 of the next dozen points en route to a 14-4 edge. The guests were never closer than eight points (15-7) from there as the Lady Shermans rolled to a 16-point win and a 1-0 match advantage. 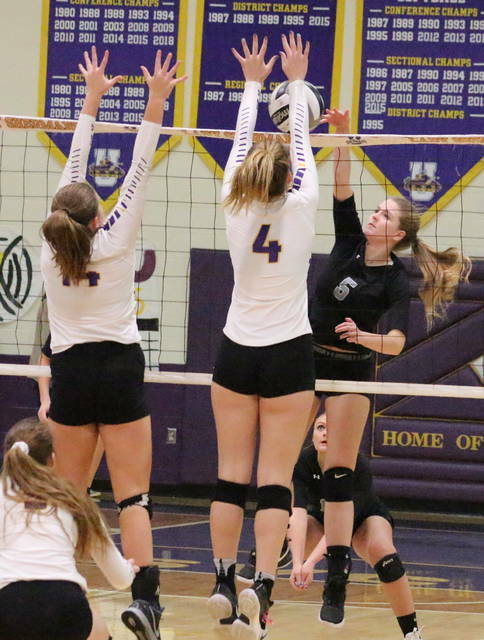 Hallie Pinkerton served UHS out to a quick 16-0 lead in Game 2, then scored nine of the final 11 points en route to a 21-point win and a 2-0 match cushion. Again, after a competitive start to Game 3, the hosts broke away from 4-2 lead by going on a 15-2 surge that resulted in a 19-4 advantage. Unioto made a 6-1 run to close out the 3-0 match triumph. The Lady Sherman produced 36 kills from seven different players, with 15 of those coming in the finale. The Purple and Gold also produced at least 10 kills in each of the three games. The Lady Raiders also scored their last service point of the match while closing to within 16-2 in Game 2. Lora Kinney led the guests with two service points, followed by Kelsey Brown and Rachel Horner with a point apiece. Mikenzi Pope paced RVHS with two kills, with Brown, Kasey Birchfield and Javan Gardener each chipping in a kill. Birchfield, Brown and Hannah Jacks had two blocks apiece, with Horner also adding a block. Kinney handed out three assists and Jacks had two assists as well. Pinkerton led Unioto with 20 service points, followed by Ava Eldrige with 13 points and Alexis Miller with a dozen points. Jocie Fisher led the UHS net attack with 14 kills, while Amanda McGlone and Cree Stulley respectively chipped in nine and four kills. It was the final volleyball match for seniors Rachel Horner, Kelsey Brown, Cierra Roberts and Jordan Garrison.